Ionia - Teos. 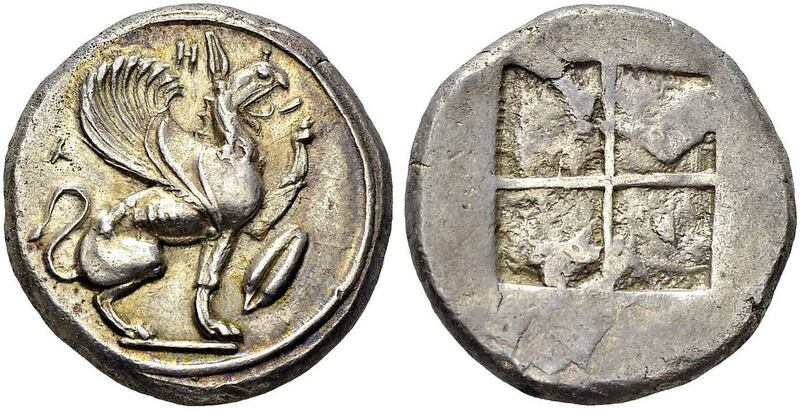 Silver stater, 460-450 BC. Obv. T-H-I above a griffin seated to right, raising its left foreleg, both wings displayed, a seed of barley on the right. Rev. Quadripartite incuse square. J.M. 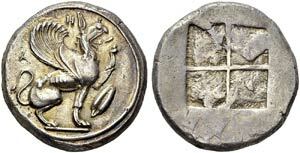 Balcer, ”The early silver coinage of Teos”, SNR 47,1968, p. 37, n° 84 (sames dies); De Luynes 2667. AR. 12.08 g.
Ex. Tkalec auction 1, february 2001, lot 128.